This is for the do-ers, myself included. It seems like we are always doing something, even when we aren’t doing anything. Doing nothing means different things to each of us, but it usually boils down to not getting anything meaningful accomplished. Taking a closer look at doing nothing usually reveals lots of activity. picking up around the house? I ask, because even now that I’ve built a life that has space for doing nothing, I have a real struggle in not doing. I don’t schedule my days full of meetings or obligations, but I do spend time engaged in my morning routine doing things like: writing, meditating, exercising, and enjoying a smoothie. Then, I work for a few hours on writing projects or helping clients with their projects. I take a long break over lunch so I have time to eat lunch, take Guinness for a walk, and then take a longer walk myself. Lovely, but still doing. Next, it’s another work block and then my evenings are usually doing something with my husband. Not everyday is like that, but most. I remember when I used to work full-time with crazy deadlines and stress, saying yes to everything, thinking that I would kill to have time to do nothing. Now that I have the time, I resist nothingness. Maybe you resist too? Do-ers like getting things done. We get a high from ticking things off the list. There is always more to do; things we want to do, and things that need to be done. We are afraid that if we do nothing, people will think we are lazy or incapable. We are afraid that if we do nothing, we will become lazy or incapable. While I love the freedom of my days and feel blessed to have the time and energy to do the things I really want to do, I have been pulled to do nothing lately. I believe there are real benefits, but I haven’t spent enough time not doing to know for sure. There is only one way to find out what not doing has to offer. Join me for a little challenge in not doing. When the excuses rush in, (“I don’t have time for that.” “Her schedule is more flexible.” “This is crazy.” or “I have better things to do than do nothing.”) recognize your resistance. If you really can’t find time to do nothing, make cuts. I’m going to start with 15-30 minutes a day and reassess after 7 days. If I enjoy the time, and observe that it contributes to health, love, or creativity, I’ll go for longer stretches. I’m starting to think that all the doing, even the really meaningful doing dilutes our energy, commitment and purpose. The doing is compromising the reason we do. This will be a very interesting challenge, thank you for inspiring me. I am in! I’m so tired right now and I think this might really help me. Do nothing. Not even meditate. Not even read. What a challenge! I’m in. This will be a challenge for me, as I love to be “doing”. However, some of my favorite moments are when I just stare out the window. It will be nice to have that quiet time in my mind. One reason it’s so hard for me to ‘do nothing’ is that when I do nothing, all my thoughts come through loud and clear. There is no way I will do 10 minutes per hour but I will try for 10 minutes per day. In Courtney’s micro-course, Creating a meaningful morning routine, one thing she suggests is to sit quietly for a period of time. I made it about 30 seconds. I am clearly a work in progress! I am SO in on this! The Doctor told me I not only am burning the candle at both ends, but I lit up the middle. 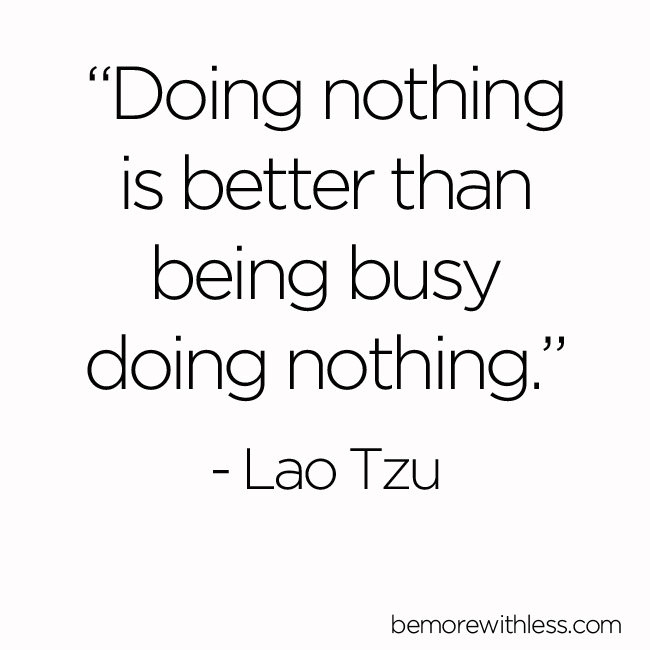 Not sure what “doing nothing” is, but want to do it. I work full time, take care of a disabled husband, do all the chores, all the work at home and outside to the point when I finally get a chance to sit down I pass out. I need this on so many levels. Thanks! Hi Susan, That is a lot of “doing” for one person. Are you able and/or willing to have help? The way things work out, I don’t really have the money for much help (I did finally get a kid to mow the lawn–which is huge since we live in an old farm house on 5 acres, but only mow around the house). We heat with wood (which is a whole animal in itself–I can deck a mule at the end of each winter-Ha! ), thankfully I am still healthy enough to do everything. We manage, but the older we get the harder it is. Financially, we can’t afford for me to quit working (although I am past retirement age) my work has No benefits, no retirement, & no pension, I will only have a small social security check when I do quit. Also, I have been the only one working for over 20 years –(however I will quit when my hubby gets to the point he can’t make it by himself until I get home from work). I do hope to try to sell off everything we are not using for extra cash (another way to pare down the house and declutter). All in all, we are doing good and are so blessed in many ways. Thank you so much for asking. my idea is not to loaf although i do. it’s i get to do as i please. nothing selfish there. i’m part time self employed. if i don’t want to do something i don’t. sometimes i just stare .like i’m meditating, but i’m not. at least not on purpose. kinda like spot on the blank wall meditation, without the wall or spot. i have to much fun. Yes! I recently left my job of nearly 30 years. I’m not retired but also not sure what I’m going to do next. My initial plan was “rest and create “. 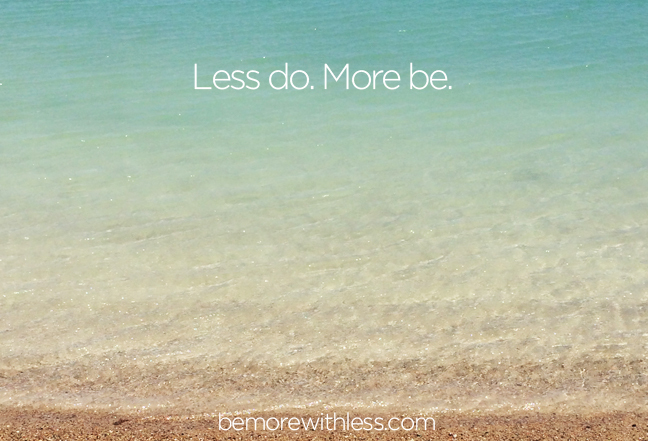 Lately I’ve found myself doing less resting and more doing. This challenge will help me get back on track. I find when I stop doing and play with just being I’m much happier and I probably get just as much done. Interesting! It sounds like you have a lot of relaxed, downtime in your life. So I’m very curious to see what you discover about doing “nothing.” I’m really curious if you find it helpful in anyway. I am going to try this! I will have to hide from the cats, though – they think my efforts to “do nothing” are invitations to be petted. I’m going to start with 15 minutes a day for this week, and see how it goes. This sounds wonderful! Will start with 10 minutes a day and go from there. Thanks! Very interesting! I have to admit…I absolutely get a “high” from ticking things off my to-do list. I’m a Type A control freak by nature, working hard every day to enjoy the moments of nothingness. I accept your challenge! Although I am really going to struggle with not having a notebook nearby to be able to jot my ideas down…this will be good for me though! The first thing I thought was ‘but what will i do while i’m not doing anything?’ I may need this! I’m in. Just like that! Finding a time slot to do nothing is not the real challenge, but rather resisting the following temptation: “Wow! I already finished that1. Which means I can squeeze in that2 before going on to do that3.” I’m going to try not squeezing in one more thing and use the time to: do nothing. – A very creative idea, Courtney! Count me in. I guess I can try this for a week and see if it works for me. Thanks for sharing courtney. Well my first few times of “doing nothing” didn’t go too well. Since I work all the time, I only have the weekend to do this along with the zillion other things that needs to be caught up on the weekends. I tried to sit quitely in the living room, but everywhere I looked there were things to do, & I couldn’t turn off my mind to the never ending list of chores & there was too much noise, so I went in & laid down on the bed and fell asleep. The next time I decided to sit outside, again, everywhere I looked there was a million things that needed done, so I closed my eyes and fell asleep, woke up with a sunburn — but had a nice nap. So far, “doing nothing” is helping me catch up on my sleep. I need a “turn off my brain” button so I won’t be constantly thinking of what I should be doing! Anyone else having this problem? I am in for this. This is a fabulous way to just unwind and let the noise in your head disappear if possible. Thanks for this challenge. I love this idea but I’m a little confused. No “formal meditating?” It seems for me that that is the only way to get to doing nothing. Without shutting down chatter in the brain it’s working and finding things and planning things. It’s the mind chatter that I need to shut down in order to completely shut down/do nothing. I’m happy to have the quietness of meditation now after a long time of resisting that and being unable to handle the stillness/quiet/nothing. That seems optimal to me.